Different Kinds of Bolt and Screw Heads | Assembly Fasteners, Inc. When choosing the right fastener for your application, you’ll need to consider several factors, including material, size, thread specification, and required torque. Most likely, you will fasten your project with screw or bolt. Though they can look identical, screws and bolts are defined by how they are installed. To install a screw, turn the head. To install a bolt, turn the nut. The screw or bolt head is a key differentiating factor. 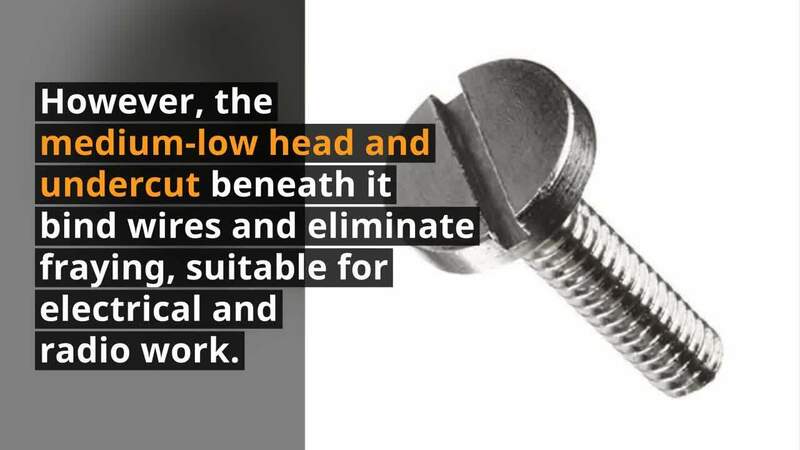 Not only is the head the most recognizable part of the object, but its properties will also dictate the application advantages of the screw or bolt. Understanding the qualities of each head type will help you to decide which type is right for you. Pan Head – Pan heads are slightly curved with a low, large diameter and high outer edge. The large surface area enables slotted or flat drivers to easily grip and exert force onto the head. Pan heads are one of the most popular head types, recommended for most new designs to replace round, truss, or binding heads. Round Head – The round head is the predecessor of the pan head. Once the most universally used design, this single-slotted domed head is now outdated. Fillister Head – Fillister heads apply more pressure to surfaces because of their small diameter. With a high edge and deep slot, they can be driven into raised surfaces, close to flanges, or in counterbored holes. Binding Head – Binding heads are another model that have been replaced largely by pan heads. However, the medium-low head and undercut beneath it bind wires and eliminate fraying, making this type suitable for electrical and radio work. Truss Head – The truss head is low, rounded, and extra wide. Also known as the oven head or stove head, this type can cover large diameter sheet metal holes, but is frequently substituted for the pan head. One-Way Head – The one-way head, as the name suggests, can only be installed one way. Once driven into a surface, the screw or bolt cannot be removed. The unique head design and function helps to eliminate costly assembly problems. Flat and Oval Heads – Flat and oval heads are suitable for products requiring flush surfaces or short lengths. Once installed, one-third of the countersunk portion can be removed for thin designs. These head types fit standard counterbored holes and work well with soft materials such as aluminum or soft plastics. Square Shoulder Screws / Indented Hexagon – Square shoulder screws combine a truss head with a square shank that resists rotation and can be staked as a permanent fastener. They come in a variety of diameters. Wrench-applied indented hexagons have sharp corners and a depression on the surface. They come in standard dimensions and many thread varieties. Indented Hexagon Washer Head / Hexagon Head / Hex Flange – Indented hexagon washer heads have the same design as indented hexagon heads with a thin washer at the base to protect surfaces from warping during assembly. Wrench-applied hexagon heads are recommended for general applications and are available in all standard dimensions and thread varieties. Hex flange bolts have wider areas underneath the head that distribute pressure and eliminate the need for washers. Assembly Fasteners Inc. (AFI) is an award-winning distributor of industrial fasteners. With over 30 years of experience providing superior quality products and distribution services, AFI can help you to decide on the perfect screw or bolt for your application. For more information about screw and bolt head types, we invite you to read the Fastener Reference Guide.